April 24, 2014 – RVFD and MCFRS units were dispatched at 10:39p for a reported house fire on Rollinmead Dr. in N. Potomac. First arriving units found a large single family home with heavy fire showing from the roof. 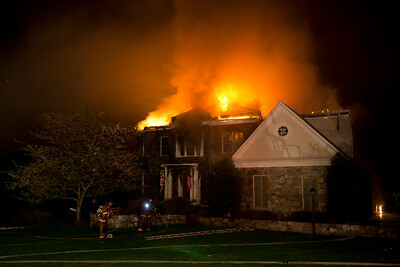 The rapid intervention dispatch had already been sent by Montgomery County Fire Communications, indicating a working fire. Shortly after arrival, command requested a second alarm. Hand-held and aerial master streams were utilized to extinguish the fire. The home suffered heavy damage.